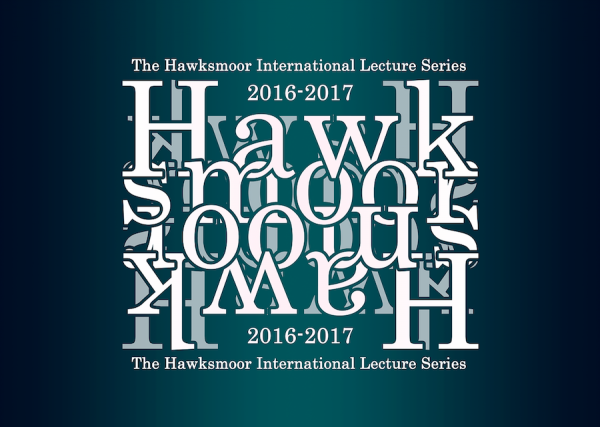 The fourth in the 2016-17 series of Hawksmoor public lectures. Anya Matthews is an art and architectural historian with a PhD from the Courtauld Institute of Art on seventeenth-century London architecture. She has worked for the Global theatre, English Heritage, and as an account director at the award-winning arts consultancy Colman Getty. Anya has also done work as a freelance publicist. Some of her publications include: ‘A Great and Noble Design’: Sir James Thornhill’s Painted Hall at Greenwich – A catalogue of the preparatory sketches’ (The Greenwich Foundation for the Old Royal Naval College, 2016) and ‘Costly without, richlier inlaid’: The post-Fire reconstruction of London’s livery halls’, Georgian Group Journal (in preparation, 2017). Supported by the Paul Mellon Centre for Studies in British Art, she is the Research Curator for the Painted Hall Conservation Project and ‘A Great and Noble Design’, a new exhibition exploring the life of the British decorative artist Sir James Thornhill and his masterpiece – the Painted Hall at Greenwich (painted between 1708 and 1727) which is on display in The Stephen Lawrence Gallery. The third in the 2016-17 series of Hawksmoor public lectures. What do we want from museums today? How might the spaces and programmes of the museum reflect shifting political and social concerns? What role can architecture play in creating and engaging museum visitors? This talk considers the role of museums in the twenty-first century, examining a range of current and emerging practices, including personal curatorial projects. It also assesses the work of leading artists, architects and film-makers, including Andrea Fraser and Hito Steyerl, who have critiqued and re-imagined the space and purpose of museums. 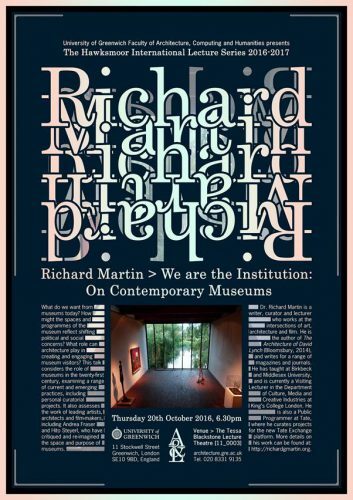 Dr. Richard Martin is a writer, curator and lecturer who works at the intersections of art, architecture and film. He is the author of The Architecture of David Lynch (Bloomsbury, 2014), and writes for a range of magazines and journals. He has taught at Birkbeck and Middlesex University, and is currently a Visiting Lecturer in the Department of Culture, Media and Creative Industries at King’s College London. He is also a Public Programmer at Tate, where he curates projects for the new Tate Exchange platform. More details on his work can be found here. The eighth in the 2016-17 series of Hawksmoor public lectures. Iain Sinclair is a British writer, documentarist, film maker, poet, flaneur, metropolitan prophet and urban shaman, keeper of lost cultures and futurologist. His books include Lud Heat (1975), Suicide Bridge (1979), Lights out for the Territory (1997), London Orbital (2002), Hackney, That Rose-Red Empire (2009), and London Overground: A Day’s Walk around the Ginger Line (2015).